Hakusan, Japan, December 3, 2015 – EIZO Corporation (TSE: 6737) today announced the availability of its free smartphone app, G-Ignition Mobile. *World’s first for LCD monitor control app with Bluetooth Smart technology. Both the Android* version and iOS version of G-Ignition Mobile will be available on December 4th. The Android version will be available on Google Play, and iOS version will be available on the iTunes Store. With G-Ignition Mobile, gamers can control their FORIS FS2735 monitor’s settings, access EIZO’s own cloud service called G-Ignition Drive, and display smartphone notifications on the monitor’s screen even when playing games on PC or consoles. G-Ignition Mobile lets gamers turn the monitor’s power on and off, adjust its volume, and switch video inputs just like using a TV remote control. Adjusting the monitor’s color is now easier than ever before. Unlike pressing buttons on the monitor, adjusting with G-Ignition Mobile’s newly designed smartphone user interface makes monitor control more intuitive. G-Ignition Drive is accessible by downloading G-Ignition Mobile. Gamers can save their monitor settings on either their smartphone or G-Ignition Drive. G-Ignition Drive stores gaming presets by game title. Gamers can import their monitor settings at gaming tournaments and LAN events or share their monitor settings with friends. EIZO will provide a gaming preset with low blue light settings and presets from EIZO-sponsored gaming teams such as Ninjas in Pyjamas on G-Ignition Drive by February. 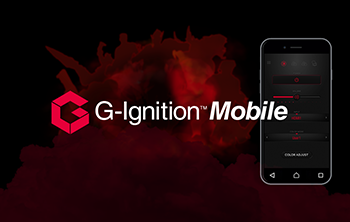 Gamers will never miss important phone calls, emails or messages with G-Ignition Mobile. Their smartphone notifications will appear on their FORIS FS2735 screen even during game play. EIZO will provide 5 kinds of notification icons with the FORIS FS2735: Phone Call, E-mail, Social, Game, and Information. EIZO is also planning to provide custom notification icons with game characters in the spring of 2016. G-Ignition Mobile product information and video is available on gaming.eizo.com/g-ignition. G-Ignition is a trademark, and EIZO and FORIS are registered trademarks of EIZO Corporation. Android is a trademark of Google Inc. iTunes is a registered trademark of Apple Inc. iOS is a mobile operating system created and developed by Apple Inc. The Bluetooth word mark and logos are registered trademarks owned by Bluetooth SIG, Inc.